This article was first published in Réalta, the journal of the Irish astrological Association, Vol 1 no.2, May 1994, pp 24-30. Michael McMullin is an astrologer and musicologist with a deep interest in the application of Jungian concepts to the understanding and practice of astrology. He lives outside Westport in County Mayo, Ireland. For some years now I have at various times been studying the system of astrology propounded by the Munich astrologer Wolfgang Döbereiner and called the Munich Rhythm Theory. I first came across this in a book on the use of astrology for diagnosis in homeopathy brought to me from Munich by a friend, and later I found one of the earlier books of Thorwald Dethlefsen dedicated ''To my teacher Wolfgang Döbereiner". This provided the extra motivation to investigate Döbereiner further and to obtain a substantial amount of other material. He publishes his own works, which can only be obtained direct, and they are nearly all in the form of transcriptions of tapes of lectures (though not the homeopathic one). This gives a better over-all view of his personality and general thinking applied to all kinds of topics which crop up in the course of exchange with the audience. In the beginning of the homeopathy book, first published in 1982 and so relatively recent, he gives us the premises from which he sets out: that the relation of the world of appearances to Time is no longer understood. That is, its relation to an inner content and development, of which the structure is reflected by its unfolding in time. The world of appearances is a picture or reflection of another pre-existing reality which unfolds according to a built-in order, and not a haphazard sequence of collisions in space (Brownian movement). The Zodiac provides us precisely with the key pattern of the way life is structured in cycles and unfolds in time. In human terms this means that our attributes are tied to time, and particular attributes can only be inherited at a particular time of birth, the houses of the horoscope corresponding to the Zodiac on a day-for-a-year basis. These attributes (the planets) unfold according to this structure, in corresponding rhythms and on different levels. When the horoscope is divided into four quadrants defined by the horizon and meridian, we have the basic structural form of manifestation and development in Time. The signs and the houses are a sub-division of these and mark twelve developmental stages, in twelve basic forms expressed everywhere and in thing - the signs being collective and the houses individual. His particular interpretation of these quadrants is the foundation of Döbereiner's quite original system of astrology, and is an integral part of his whole philosophy and understanding of reality, which is of an exceptionally high order and spiritual level - on the same level, let us say, as that of Plotinus, with whom he could have had no serious disagreements. This puts him probably in a category by himself among contemporary astrologers, whether or not we agree with him in all particulars and workings-out of his system - a thing no responsible person can reasonably demand from any one fellow human being. He is a person who can think, and think for himself, and who understands just what astrology means, for our whole thought system and its full implications for humanity. For this reason I regard him as not only one of the most important astrologers, but as one of the most important thinkers of our time. 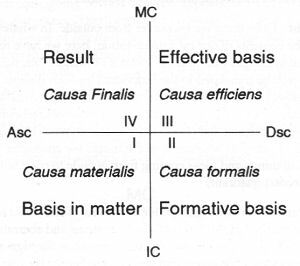 The four quadrants (see fig. l) are categorised in the first place in the the Aristotelian sense of the four Causalities, or the four bases (fundamental principles of existence). Quadrant I: the properties which become visible in the person himself. Quadrant II: those which become visible or take form through the person; what he produces. Quadrant III: the people or ideas which bind a person to the visible world, and which he encounters outside himself (or projects). Quadrant IV: the result and final meaning arrived at through the process of development. All the properties independent of the personal and circumstantial life, which are beyond this and unconscious, and survive individual existence. These descriptions of the four bases (or phases of realisation) represented by the quadrants can be enlarged upon almost indefinitely. They are not easy to understand, and I can only attempt here as intelligible as possible a summing up of the matter, condensed from discourses by Döbereiner on different occasions. 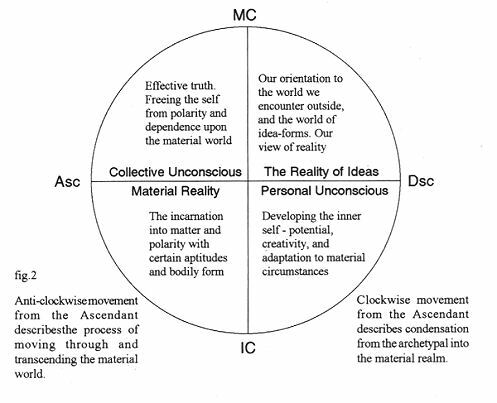 The 1st quadrant represents concrete, spatial reality; the entry into the time, space and polarity of the material world. The first or cardinal house is the initiating action of each phase, the "thing as such'' and its inherent nature; the second house is the substance, here for example the body and its organs, and roots in the material world; the third house is the function , here the occupation and differentiation of visible space. The 2nd quadrant: Instinctual feelings press up to connect the inner (4th house) with outer experience for the orientation of action. This is the emotional or psychic energy, or libido, leading to creativity or the urge to give birth to forms (5th house) through "inner pictures" (evidently unconscious archetypes). But this needs a polarity, an encounter from the outside, which takes place in the third quadrant and which acts as a projection screen, or a visible embodiment, making a connection with the inner archetype. This quadrant is completely internal as opposed to physical and only here do we actually experience things emotionally. In the 6th house we have to adapt our self-expression to the prevailing external conditions and limitations and this is how we function in the world as individual and rational persons. The 3rd quadrant: Everything we encounter from outside. In whatever we encounter we are confronted with the contents of our own imagination; here we have receptivity to images (7th house), attachment to images (8th house), and use of images (9th house). The contents of the environment can only be translated to the individual through images. It is here that our inner capacity finds its object, or its material, or its motivation in the outside world; in other words, we find our own inner world and needs symbolised in what we meet outside, and this symbolism is the content of what we encounter. We find inner archetypes outside in the things which have meaning for us, the finding of wholeness in the things we encounter. We need the constantly renewed stimulus of things and ideas coming from outside to react with and call forth our own inner creativity (2nd quadrant). The 8th house represents in one sense the ideas or view of the world to which we are attached or committed. This can include all kinds of ideals, systems and aberrations, as well as cults and cult-figures upon whom people become fixated. Scorpio is the sign of fixed feeling. We can become fixated on an idea to the extent that we can transfer it to the 1st quadrant, i.e. crystallise it into material form, as a wish fulfillment. Nearly all of us are conditioned from birth to a certain fixed way of interpreting our perceptions of the world. We say: ''everybody sees things thus, so it must be real". But with a different orientation of perception, not to say different senses, entirely different views of reality result; one only has to think of how things must appear to different kinds of animals, and also children, before they become fully socialised and conditioned. There are also of course adults who can tune in to other levels of energy, or see energy. The capacity for relating to the surrounding world depends on the potential of each individual for such relating, or for digesting, as it were, the impressions received (2nd quadrant). Stupidity is a kind of protection against impressions one cannot deal with. The 4th quadrant: What is effected as a result. This exists apart from intention or calculation, is self-sufficient and independent of the subject; it transcends the ego. It represents what becomes of our lives, the truth of the person's being, the ultimate significance, which he himself cannot see. Saturn (10th house) puts bounds on subjectivity, and in the 11th house there is a suspension of subjective values giving a more universal significance. In the 12th house is transcendence, the suspension of reality, entry into the ''manifest truth of the world'' (which is distinguished from what is materially real). Today we are trapped in the 1st quadrant, in the Causa Materialis. Truth on the other hand is perceived in the 3rd quadrant, unites with personal experience and takes on visible form in the 2nd quadrant or becomes an event in the 1st quadrant. Döbereiner’s interpretation of a horoscope is governed in the first place by this understanding of the quadrants, and the distribution of the planets shows how each quadrant is emphasized or relatively neglected or unrealised. The houses and signs, considered in their mundane or natural, order are the beginning, middle, and end of each quadrant. Each third house of the three is how we relate in this phase to the outside. Thus in the first quadrant, the Causa Materialis, the 3rd house is factual, knowledge of outward differentiation in the concrete, spatial and factual environment; this also includes protection and differentiation of the ego. In the 3rd quadrant, the Causa Efficiens, the 9th house is the knowledge of sensed or felt associations, that is of symbols and correspondences going beyond concrete appearances and mechanical causality, and relating to the whole of existence. This therefore is the house of Understanding in the spiritual sense, opposed to the 3rd house of Intellect. In the second quadrant, the Causa Formalis, the corresponding house is the 6th, which is the stage of the orientation of one's life instinct and self- realisation to the conditions in which one finds oneself and has to fit into. One could say the comparison and utilization of those conditions, and this is achieved through Rationality. Thus intellect and rationality are stages of developing consciousness, while understanding has something else added beyond the interests of the individual ego, an ingredient of awareness. In the 12th house opposite the 6th, we are released from rationality and the necessity to adapt to the material world, and can enter into another kind of consciousness - pure awareness (or also unconsciousness). In teaching his method Döbereiner insists on starting by acquiring a thorough understanding of the main structural features and basic factors of a horoscope. After the quadrants, the primary factors are the Ascendant (ASC) and its ruler(s), the Sun, and the Midheaven (MC) and its ruler(s). The ASC represents the "endowment", the attributes or make-up with which we come into this world, and which strive for fulfillment or externalisation, and which because of this seek out the appropriate event. The sign on the ASC, the placement of its ruler (or rulers in the case of an intercepted sign in the lst house), and also any planets in the 1st house, show the nature of this endowment. The Sun shows the manner in which this endowment is realised, or the behaviour, which "binds these attributes to time and space". The attributes unite with the behaviour in events - the behaviour can satisfy the attributes by supplying the necessary events, when the attributes become identified with the outward manifestation: "The realization (Sun) is the attempt to bring the endowment (ASC) as fully as possible into consciousness or experience". The endowment is, so to say, a slumbering state and is driven out by this manner of externalization. He compares it to the prince in the fairy tales who has been cast under a spell, while the Sun is the task which has to be performed for deliverance, the only way the dharma can be achieved. The ASC is the "thing as such", the Sun is the fulfillment. The MC and 10th house then shows the significance of the individual's development, his "calling" or dharma - (not career, for he makes his living in the 6th house). Here, extra personal criteria are binding; this is what he means to other people, or what his achievement means in terms of the world at large, as an end result. The situation of the ruling planet then throws light on this. Döbereiner as a teacher will start from the horoscope showing the houses but no planets, and insist on assessing the basic lay-out of the person or thing concerned from this alone. Then the ruler of the ASC is added and the Sun, and from this much, and perhaps eventually with the ruler of the MC, he will read the essential life situation, the needs and manner of manifestation of the subject of the chart, whether a person or event. Only after this will the other planets be added, to fill out or confirm what is already manifest, and he insists that to be confronted with all of these from the start is only confusing, until we understand first how to interpret the essentials. In this way we come to appreciate not just the particular characteristics or events, but also the content, structure and reasons for them. What you don't realise in your attributes (Anlage, lay-out, capacities, or potential) and integrate into your reality remains open, like a free valency, and has to be filled from the outside as an event or as Fate, as soon as an equivalent situation arises. A person cannot be influenced in a way to which he is not predisposed in his horoscope, and if you try circumvent his fate, or the natural outcome of his inner make-up, you are not doing him a favour. Döbereiner's viewpoint is not that planetary placements either cause, foreshadow, or predetermine your fate, but instead show a content which chooses available situations or conditions to fulfill itself, like a meeting or matching of energies. In other words, it is we ourselves who seek out, or unconsciously set up the conditions we need to work out or correspond to our own reality, or resolve our inner incompatibilities, if not constructively and consciously within ourselves, then in the form of outer circumstances and events, thus referring the problem to the 1st quadrant. It is an equalisation of energies in a situation of unequal pressures or gradients, a seeking of equilibrium. A readiness or need for a certain development is carried around with us like a suction, which attracts what is needed from our surroundings. This can only be prevented by being aware of this need beforehand and equalising it by living it consciously - that is by fulfilling our potential - otherwise it will be fulfilled or compensated from outside. A victim of an attack or an accident has to have a psychic readiness for such an event, and if he were not inwardly set up for it he would have an immunity, it could not happen to him. "I could nearly say that there can be found in the chart of a slandered person the necessity to be slandered", or, if he doesn't have a suitable Mars combination, "he could walk among a herd of tigers" (an old Chinese saying) and not be harmed. In other words one is oneself responsible for what happens to one, and this should obvious from the fact that it can be read in one's horoscope. Döbereiner says: ''If astrology brings no other result than that this is understood, this already is enough". This also means that we should trust in our fate, because if we are not carrying around within us some serious unresolved conflict that we refuse to deal with, no harm can come to us from "accidents", etc., and it is useless consulting an ephemeris before we step out of the house. This also applies of course to the kind of messes so many of us get into in our lives, and to sickness. "A neurosis is always a protection during psychic cleansing processes, a religious procedure,..then only rituals help". We find here a very humane (Piscean) view of neuroses compulsions, etc., through seeing and understanding the patterrns and imbalances in which they originate, and how these may be expressed or offset in a conscious and positive manner. He is extremely critical of psycho-analysts, who address symptoms like the medical profession and merely ''exchange the patient's compensations for those of the analyst or of the public system of rationality". A patient may have some symptom removed or suppressed and four years later succumb to another or die of the first treatment or even be run over by a car, while the doctors have no way of seeing the connection between these things, having no suspicion that there can be such connections. They take things out of their context (constellations) and so the patient can never be free of them. When, with the suppression of astrology, you don't know the sense or meaning of a sickness, you had better leave it alone. The client on the other hand has to understand that he must take responsibility himself for the constellation, and it will resolve itself. "Therapies cannot replace fate". It goes without saying that a good deal of astrology comes under the same censure, and Döbereiner is rather sweeping in this respect; I think he would sweep aside most of what I have to say myself as "pseudo-culture-philosophical Gequatsche" (empty twaddle, gibberish, balderdash). He does not allow that the four elements play any valid role, and does not show any sign of relating to Jungian concepts, mythology, or even traditional astrology. He is one-pointedly propounding his own quite original system, but certain aspects of this are valuable enough to rank him as one of the most important thinkers in the field, and an essential contributor to the significant development and proper understanding of astrology in the future. You could say he has attained to a very realistic view of human behaviour and its motivations, free from cliché-laden valuations, and consequently also free from moral judgements of individuals, since the inner make-up and needs, compulsions and illusions of each are astrologically transparent. Describing things as they really are can often sound cynical when up against more naive and conventional opinions; but cynicism implies a negative moral judgement, without sympathy, whereas here we are talking about understanding and the need for inner truth, confronted with the workings of destiny. Each individual has to work out his own truth according to the pattern represented in his horoscope, otherwise it will come to him from outside and appear to be fated. These are far more than just a set of astrological text books. It is a whole initiation into the real nature of ourselves and the world, and our relation to it. And the key to this is his understanding of the different levels of reality, material, psychic and archetypal, or belonging to the realm of Forms, and the processes through which they manifest. As an exponent and teacher of thinking in symbols he is in fact parallel with Jung and on exactly the same course, laying the foundations of an entirely different logic and paradigm of reality from that to which we are conditioned at present. - "of the concordance of the souls with the ordered scheme of the Cosmos ... to the extent that their-fortunes, their life-experiences, their choosing and refusing, are announced by the patterns of the stars - and out of this concordance rises as it were one musical utterance: the music, the harmony, by which all is described is best witness to this truth." The publications of Wolfgang Döbereiner are obtainable from: Verlag Döbereiner, Agnes-Bernauer-Strasse 129, 8000 Munchen 21 . These consist of: Textbook of Astrology in six volumes, of which Vols. 1-3 are available in English. Also in English are Patterns of Experience, the volume of Astrology/Homeopathy . There are also fairly numerous volumes of transcriptions of seminars listed, but in German, together with a very interesting work on paintings and the astrological characteristics of the painters that are discernible in them. Unfortunately this too is only to be had in German: Astrologisch definierbare Verhaltensweisen in der Malerei.